Again, Hillary Clinton misses the mark of actually being funny in a recent video posted to the Clinton Foundation’s YouTube channel of a “prank call” the former Secretary of State receives from “House of Cards’ ” Frank Underwood. 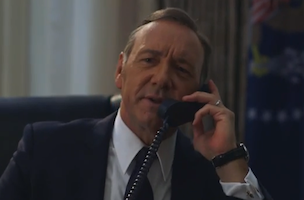 In it, Spacey imitates former President Bill Clinton, and in closing, the former First Lady encourages Underwood to sign Bill’s online and public 68th birthday card. WATCH, and comment if you actually laughed.